Levin Killman was born about 1795 in North Carolina. He was the son of Henry Killman and Delilah Jensie Broadhead. Mary Hendrick was born in about 1790 in North Carolina. Her parents are unknown. On the 1840 US Census, Levin was head of a household in Monroe Kentucky. There were 8 in the household: 2 males aged 10-14 (Henry was 11 & Calvin was 10); 1 male aged 40-49 (Levin was about 45); 1 female aged 5-9; 1 female aged 10-14 (Milly was 10); 2 females aged 15-19; 1 female aged 40-49 (Mary was about 50). There are 3 unknown children on this Census. The last record I have of Levin and Mary is the 1850 US Census, the family lived in Overton, Tennessee. Levin was 55, Mary was 60, son Henry was 21, and daughter Milly was 20. 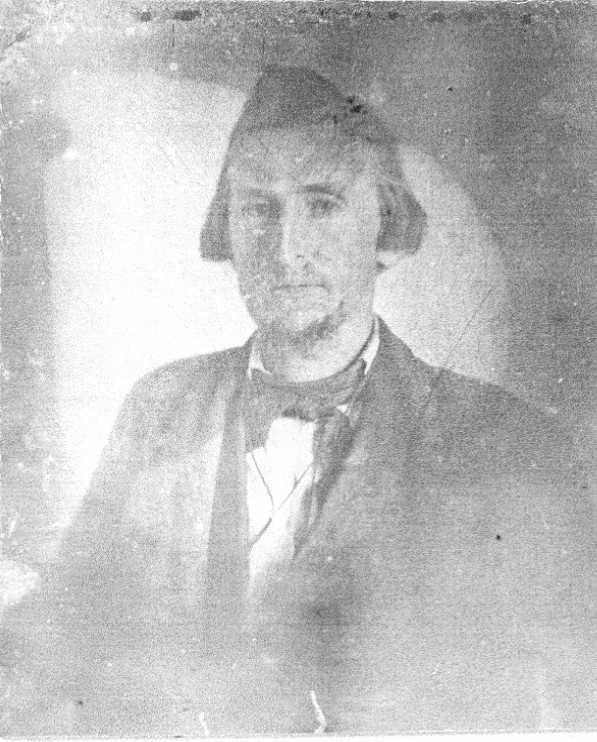 Calvin Killman – Calvin was born about 1830 in Tennessee. He married Martha (last name unknown) and they adopted a daughter. The last record I have of him is the 1880 US Census, when he was 50 and lived in Burkesville, Cumberland County, Kentucky with his wife and daughter. Henry Killman – My 3x great grandfather Henry was born about 1829 in Tennessee. He married Susan Releabie Hopper in about 1851, and they had 4 children. Henry died August 14, 1893. Read about him here. Milly Killman – Milly was born about 1830 in Tennessee according to the only record I have of her, the 1850 US Census. Other children, according to grandson Stephen Alford Killman, who applied to the Eastern Cherokee claiming Levin’s mother Delilah Jensie Broadhead was Cherokee, Levin and Mary also had children named Jane, Delilah, Phoebe and Polly Ann. Stephen Hopper & Bethenia Robertson are my 4X great grandparents, the parents of my 3x great grandmother Susan Releabie Hopper. Stephen Hopper was born in 1790 in Gradyville, Adair County, Kentucky. He was the son of Harmon Hopper and Sarah Cole. Bethenia Robertson was born 1793 in Gradyville, Adair County, Kentucky. She was the daughter of William Robertson and Violetty Lettice. Stephen and Bethenia were married on July 27, 1811 in Adair County, Kentucky. He was about 21 and she was about 18. On the 1830 US Census, Stephen was head of a household of 10 in Adair County, Kentucky. The household included: 1 male aged 5-9 (Thomas); 1 male aged 40-49 (Stephen was 40); 2 females under age 5 (Susan was 1); 3 females aged 5-9; 2 females aged 10-14 (Iceyphena was 12); 1 female aged 30-39 (Susan was 37). There are 6 unknown children on this Census. On the 1840 US Census, Stephen was head of a household of 13 in Adair County, Kentucky. The household included 1 male aged 15-19 (Thomas); 1 male aged 40-49 (Stephen was 50); 2 females aged 5-9 (Nancy was 7); 2 females aged 10-14 (Susan was 11); 2 females aged 15-19; 2 male slaves under age 10; 1 female slave under age 10; 1 female slave aged 24-35; 1 female slave aged 36-54. There are 4 unknown children on this Census, and wife Bethenia wasn’t counted. A family record available on Ancestry.com indicates that Bethenia died in 1845 in Gradyville, Adair County, Kentucky. She was about 52. Stephen married Mary Polly Roach on November 23, 1845 in Kentucky. He was about 55 and she was 23 or 29 depending on which census you believe. On the 1850 US Census, Stephen was 60 and wife Mary was 27. Neither could read or write. Children in the home were: Nancy, age 17; William. age 10; Stephen, age 8; Harrison, age 6; Meredith, age 4. Stephen died in Gradyville, Adair County, Kentucky in 1858. He was about 68. Iceyphena Hopper – Iceyphena was born August 18, 1818 in Kentucky. She married Clemon Hopper on October 14, 1835 in Adair County, Kentucky. They had 10 children. 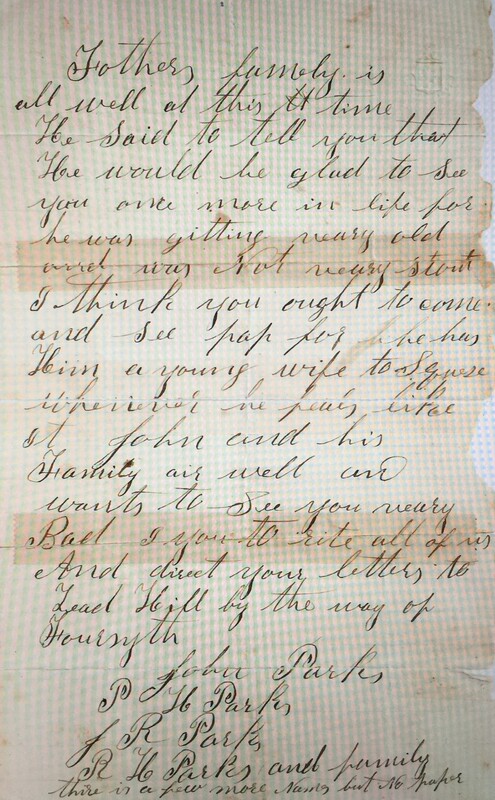 Her son Creel reported, in a letter available on Ancestry.com, that four of her sons (along with 5 of her brothers) served for the Union in the Civil War. She died February 12, 1879 in Taney County, Missouri. She was 60. Her Find A Grave memorial is here. Thomas J. Hopper – Thomas was born sometime between 1821 & 1824 in Kentucky. He married Easther Rowe on January 7, 1841 in Adair County, Kentucky. They had 8 children. He served Kentucky Infantry in the Civil War, and died in 1867 according to the Civil War Pension card reflecting Easther filing. He was between the ages of 43 & 46. Susan Releabie Hopper – My 3x great grandmother Susan was born in about 1829 in Tennessee. She married Henry Killman in about 1851. They had 4 children. Susan died November 6, 1895. She was about 66. Read about her here. Nancy Hopper – Nancy was born in 1833 in Kentucky according to the only record I have of her, the 1850 US Census. William H. Harper – William was born in 1840. He married Samantha Jane Denton on August 5, 1866 in Adair County, Kentucky. They had 6 children. The last record I have of him is the 1900 US Census when he lived in Dublin City, Erath County, Texas with his wife. He was a minister. His wife died in 1901 and she is buried in Erath County, Texas. Stephen Alford Harper – Stephen was likely born in 1842 but his Find A Grave memorial says he was born on January 15 ,1844. He married Nancy Elizabeth Sexton on September 12, 1870 in Metcalfe, Kentucky. They had 4 children. He married Maude Elizabeth Nelson on May 8, 1890 in Adair County, Kentucky. They had 6 children. Stephen died September 29, 1914 in Gradyville, Adair County, Kentucky. His Find A Grave memorial is here. Harrison P. Harper – Harrison was born January 8, 1844. He enlisted in Company E, Kentucky 3rd Infantry Regiment on Oct 8, 1861. He mustered out on September 26, 1864. He transferred to Company Battery A, Kentucky Light Artillery Battery on September 26, 1864. He mustered out on June 26, 1865 at Nashville, TN. Harrison married Mary Wilson on April 2, 1864 in Adair County, Kentucky. They had at least 5 children. The last record I have of him is on the 1880 US Census, when he was 34 and lived in Leatherwood, Adair County, Kentucky with his wife and 5 children. Manurvia Catherine Harper – Manurvia was born in 1853. She married William E. Edwards on January 18, 1869 in Adair County, Kentucky. She died Mar. 17, 1891 in Edinburg, Christian, Illinois. She was 38. Her Find A Grave memorial is here. Henry Killman & Susan Releabie Hopper are my 3x great grandparents, the parents of my 2x great grandmother Mary A. Kilman. Henry Killman was born about 1829 in Tennessee. His year of birth varies greatly on the documents I have: 1829 on the 1850 US Census, 1824 on the 1860 US Census, 1826 on his Civil War enlistment, 1830 on the 1870 US Census and 1824 on the 1880 US Census, which also changes his birthplace to Kentucky.) His parents were Levin Killman & Mary Hendricks. Read about them here. Susan Releabie Hopper was born in about 1829 in Tennessee. Her year of birth varies on documents I have: 1827 on the 1860 US Census, 1833 on the 1870 US Census, 1826 on the 1880 US Census. Her parents were Stephen Hopper & Bethenia Robertson. Read about them here. Henry was found on the 1850 US Census at age 21 in Overton, Tennessee living with parents Levin (age 55) and Mary (age 60). Also in the house was sister Milly, age 20. Henry and Susan married in about 1851. On the 1860 US Census, in Monroe, Kentucky, Henry is listed as 36, and Susan is listed as 33. They had 3 children: Stephen, age 8; Edna, age 4; Mary, age 3. Also in the house were boarders Luford Short, age 22, and Thomas Walker, age 21. Henry, Mary and the two boarders are marked as unable to read or write. Henry enlisted in 1861 to fight for the Confederacy in the Civil War. He served as a private in 25th Regiment, Tennessee Infantry Company G.
On the 1870 US Census, still in Monroe, Kentucky, Henry is listed as 40 and Susan is listed as 37. Stephen was 17, Edna Jane was 14, and Mary was 12. The family moved to Missouri. Minutes of Mincy Valley Baptist Church of Christ from October and November of 1873 indicate that Henry & Mary and their daughters Mary and Edna were baptized. Henry died August 14, 1893. He was about 64. Susan died November 6, 1895. She was about 66. Stephen Alford Killman – Stephen was born February 25, 1853 in Monroe, Kentucky. He married Nancy Watson in about 1872 and they had 6 children. He married Catherine (last name unknown) in about 1897 and they had 3 children. Stephen’s applications to Eastern Cherokee (denied) lists his mother’s name as Susan Releabie Hopper, his own birthdate and birthplace, his children and their birthdates, his parents death dates, his grandparent’s names and their children’s names. He claimed his grandparents and great grandparents were driven from a reservation in Tennessee in 1835. My last record of him is on the 1930 US Census when he lived in Creek, Okfuskee, Oklahoma with his daughter Elizabeth’s family. Edna Virginia Jane Killman – Edna was born in 1856. She married John Hiram Thomason in 1875. They had 8 children and divorced. She was listed as widowed on the 1910 and 1920 US Census, but her husband had remarried and had another child. She died in 1923. Her Find A Grave memorial is here. Mary A. Killman – My 2x great grandmother Mary was born is September of 1858 in Kentucky. In 1883, she married Abraham Parks. They had 3 children. Read about her here. William Killman – William was born about 1870 in Tennessee and appears only on the 1880 US Census. Philip Parks and Katherine White are my 4X great grandparents, the parents of my 3X great grandfather Robert Huntington Parks. Philip Parks was born in 1779 in Maryland according to the 1850 US Census. He was the son of Philip Parks and Hannah Peckon/Packcow/Packow. Philip and Katherine married in about 1800. Philip Parks is listed on the Tennessee Early Census Index as living in Washington, Tennessee in 1814. On the 1830 US Census, Philip Parks was head of a household in Washington, Tennessee. There were 11 in the household: 2 males aged 10-14 (John was 11); 2 males aged 15-19 (William was 17 and Philip was 19); 1 male aged 20-29 (Robert was 20); 1 male aged 50-59 (Philip was 51); 1 female under age 5 (Katherine was 5); 1 female aged 5-9 (Rebecca was 8); 1 female aged 10-14 (Nelly was 13); 1 female aged 15-19 (Mary was 15); 1 female aged 40-49 (Katherine was 50). Daughter Sarah would have been 10, and isn’t accounted for here. There’s an extra male aged 10-14. On the 1840 US Census, Philip Parks was again head of a household in Washington, Tennessee. There were 8 in the household: 2 males aged 5-9 (unknown); 1 male aged 30-39 (probably Philip, age 29, though he was enumerated living alone also); 1 male aged 60-69 (Philip was 61); 1 female aged 10-14 (daughter Katherine was 15); 1 female aged 15-19 (Rebecca was 18); 1 female aged 20-29 (Sarah was 20); 1 female aged 50-59 (Katherine was 60). Philip’s wife Katherine died between the 1840 & 1850 Census. On the 1850 US Census, Philip Parks was in Subdivision 4, Washington, Tennessee. He was 71 and born in Maryland. He lived with son Philip Parks, age 39 and born in Tennessee; Sarah Ramsey, age 20 and born in North Carolina; and Eliza Ramsey, age 1 month, born in Tennessee. Philip’s will, dated March 22, 1854, divided his estate as follows: to daughter Elizabeth Booth, $50 in trade if is she outlives her husband, and if not to her heirs; to daughter Nelly Nelson, $50 in trade; to daughter Nancy Tinker, $50 in trade; to son Robert Parks, $50 in trade; to son William Parks, $50 in trade; to daughter Sarah White, $50 in trade; to daughter Katherine Andes, $50 in trade; to daughter Rebecca Orr, $50 in trade; to supposed daughter of deceased son John Parks, Tilda Jane Freeman, $100 in trade at age 21; to son and executor of estate Phillip Parks, $50 in trade, and the value of a mare and mule colt detained by son-in-law Samuel Erwin (husband of daughter Mary Erwin), and balance of estate. Elizabeth Parks – Elizabeth was born in 1804 in Washington County, Tennessee. She married John Booth in 1828 in Washington County, Tennessee. They had 12 children. She did outlive her husband by 10 years, so she got her inheritance. Elizabeth died in 1875 at age 71 or 72. Her Find A Grave memorial is here. Nancy Parks – Nancy was born about 1808 in Washington County, Tennessee. She married James Abraham Tinker and they had at least 9 children. I found mention that they helped found Shallow Ford Church in Unicoi County, Tennessee. The last record I have of her is on the 1880 US Census when she was widowed, age 74, and living in Browns, Unicoi County, Tennessee. Robert Huntington Parks – My 3X great grandfather Robert was born about 1810 in Tennessee, probably in Washington County. He married Mary Andes on March 17, 1831 in Washington County, Tennessee and they had 4 children. He married R Andes on June 21, 1841 in Washington County, Tennessee. They had my 2X great grandfather Abraham. He married Prudence Cheek Coker in Arkansas in about 1860. They had two children. It is thought that Robert died in 1873 in Lead Hill, Boone County, Arkansas at age 63. Read about him here. Philip Parks – Philip was born in 1811 in Washington County, Tennessee. He is found twice on the 1860 US Census, both times in Phelps County, Missouri. First he was living with the John Salt family in Rolla and two months later living next door to the John Salt family in Green. John is thought to have died in the Civil War. Philip married John’s wife, Mary Ann Scotts Salt by the 1870 US Census. The last record I have of him is the 1880 US Census when he was 68 and lived in Dillon, Phelps County, Missouri with wife Mary. William Parks – William was born October 23, 1813 in Washington County, Tennessee. He married Nancy Erwin on June 13, 1835 in Washington County, Tennessee. They had at least 7 children. He died December 20, 1885 at age 72. His Find A Grave memorial is here. Mary Parks – Mary was born in 1815 in Washington County, Tennessee. She married Samuel Erwin in Washington County, Tennessee on December 19, 1832. They had 15 children. On the 1900 US Census when she was widowed and 84 years old, living with daughter Mary in Civil District 7, Unicoi County, Tennessee. She died June 13, 1909 at age 93 or 94. Her death record indicates she was a midwife. Eleanor “Nelly” Parks – Nelly was born in 1817 in Washington County, Tennessee. She married James Berryman Nelson on May 2, 1826 in Washington County, Tennessee. The only record I have of the family is the 1850 US Census, when Eleanor was 43 and lived with husband James and 7 children in Subdivision 4, Washington County, Tennessee. In 1860 James was living in the same area with his 2 youngest children, with his brother’s family. John Parks – John was born in about 1819 in Washington County, Tennessee. The only record I have of John is the mention of him in his father’s will. He was deceased by the time of the will in 1854, and was thought to be the father of Tilda Jane Freeman. Sarah Parks – Sarah was born in 1820 in Washington County, Tennessee. She married Joseph White on March 5, 1842 in Washington County, Tennessee. On the 1850 US Census she was 30, married to Joseph White, and living in Subdivision 4, Washington County, Tennessee with 4 sons. On the 1880 US Census she was 62, widowed, and living in Macon, Tennessee with her son George’s family. Rebecca Parks – Rebecca was born in 1822. She married Henry Jackson Orr on December 9, 1847 in Washington County, Tennessee. She died in 1880 in Carter County, Tennessee at age 58 or 59. Her Find A Grave memorial is here. Katherine Parks – Katherine was born in 1825 in Washington County, Tennessee. She married William Andes in about 1846, and they had at 10 children. She was a widow, age 55, on the 1880 US Census. She lived in Richland, Shelby, Illinois with 3 of her children. Katherine died on January 10, 1883 in Shelby County, Illinois. Her Find A Grave memorial is here. Robert Huntington Parks and R. Andes are my 3X Great Grandparents, parents of my 2X great grandfather Abraham Parks. There is a lot of conflicting information on this family. I have sifted through it and I am posting what makes sense to me. Please do not hesitate to propose different facts – leave a comment or message me. I do not feel sure about the facts here, but I wanted to put something out to start a conversation. Robert Huntington Parks was born about 1810 in Tennessee, probably in Washington County. He is the son of Philip Parks and Katherine White. R. Andes was born about 1824 in Tennessee according to the 1850 US Census. But who is she? She could be Ruth Andes, daughter of William Andes and Lavina Maria Fine. William’s will of December 1856 in Washington County, Tennessee lists his children as: Mary Parks (but our Mary Andes Parks died prior to 1841), Barbary Walter, Allen Andes, Rebecca Davis, John J. Andes, Abraham Andes, Catherine Leach, William D. Andes (who married Robert’s sister Katherine Parks) and Ruth Parks. There is a will which Robert H. Parks witnessed along with Abraham Andes (son of William and brother of Ruth) for Abraham Fine in 1843. Abraham Fine could be the brother of Lavina Maria Fine Andes, Robert H. Park’s mother-in-law if he were indeed married to Ruth Andes. Robert married Mary Andes on March 17, 1831 in Washington County, Tennessee. My only record of her is the marriage record, so I do not know when or where she was born or who her parents were. Robert and Mary had at least 4 children, 2 born in Tennessee and 2 born in Kentucky. Mary died by 1841. Robert returned to Tennessee and married R Andes on June 21, 1841 in Washington County, Tennessee. 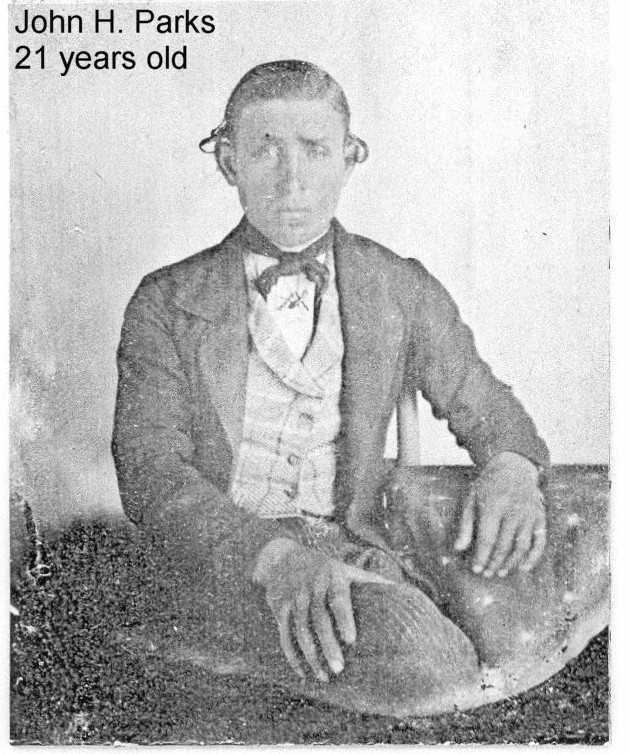 They had a child in 1842 in Tennessee – my 2x great grandfather Abraham. Then the family headed west to Southern Missouri, then Northern Arkansas, back to Southern Missouri and back to Northern Arkansas. On the 1850 US Census, Robert was 40 and his wife R was 26. The family lived in Swan, Taney County, Missouri. There were 5 children at home, all but the youngest born to his Robert’s first wife Mary: William, age 18, born in TN; Philip, age 16, born in TN; John, age 14, born in KY; Albert, age 11, born in KY; Abraham, age 8, born in TN. R died sometime after the 1850 US Census. Robert married Prudence Cheek in Arkansas. She was widowed by Leonard Coker and had at least 5 children. On the 1860 US Census, Robert was 50 and wife Prudence was 34. They were farming in Sugar Loaf, Carroll County, Arkansas with Robert’s 2 youngest children, and Prudence’s 5 children. Albert was 21; Abraham was 18; Emeline (Coker) was 10, born in AR; HW (Coker) was 9, born in MO; Sarah (Coker) was 7, born in AR; James (Coker) was 4, born in AR; Malinda (Coker) was 2, born in AR. “Father’s family is all well at this time. He said to tell you that he would be glad to see you once more in life for he was getting very old and was not very stout. I think you ought to come and see pap for he has him a young wife to squeeze whenever he feels like it. John and his family are well and wants to see you very bad. Write all of us and direct your letters to Lead Hill by way of Forsyth. In 1864, Robert H. Parks of St. Charles, Missouri, in the occupation of “cider” paid $98.95 in taxes. It was 5% of the $1979 valuation. On the 187o US Census, Robert was 60 and Prudence was 45. They were still in Sugar Loaf, Boone County, Arkansas. There were 5 children at home, one from Robert’s first marriage, three from Prudence’s first marriage, and two they had recently had together: John, age 32; HW (Coker), age 19; Sarah (Coker), age 17; James Robert (Coker), age 14; Catherine Elizabeth, age 8 and born in Missouri; Mary Ann, age 6 and born in Missouri. It is thought that Robert died in 1873 in Lead Hill, Boone County, Arkansas at age 63. William Parks – William was born February 12, 1832 in Tennessee. He married Melissa Jane Baker in about 1858 and they had a daughter, Zoe. 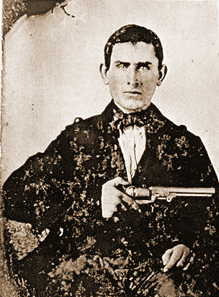 William was killed by bushwackers on August 17, 1862 in Berryville, Carroll County, Arkansas. He was 30. Philip Parks – Philip was born April 22, 1835 in Tennessee. He married Nancy Elizabeth Holt on July 31, 1870 in Shelby County, Illinois. They had 8 children. He died February 15, 1917 in Shelbyville, Shelby County, Illinois. He was 81. His Find A Grave memorial is here. John Henry Parks – John was born November 1, 1835 in Woodford County, Kentucky. Served in Civil War. According to his tombstone, he was a 3rd Sergeant with Company C of the 3rd Texas Artillery, Confederate States of America. He married Mary Elizabeth Morris in 1873. They had 4 children. He died April 17, 1906 in Taney County, Missouri. He was 70. His Find A Grave memorial is here. I think the Henry she is speaking of was H.W. Coker Parks, born in 1851 to Prudence Cheek and Leonard Coker, who disappeared after the 1870 US Census. If this is the case, Henry was not dead when John returned from the Civil War. There is not another potential Henry on a Census with Robert Huntington Parks. Albert A. Parks – Albert was born in about 1839 in Kentucky. The last record I have of him is on the 1860 US Census. Abraham B. Parks – My 2X great grandfather Abraham was born in March of 1842 in Tennessee. He married Eady Anne Alley (maiden name Cane) on September 6, 1866 in Shelby, Illinois. They had 2 children. He married Mary A. Kilman in 1883. They had 4 children. Abraham died December 4, 1900 in Boone County, Arkansas, according to Arkansas Confederate Pension Records. He was 58. He is buried in Cedar Creek Cemetery in Cedarcreek, Taney County, Missouri. His Find A Grave memorial is here. Read about him here. Infant Parks – Infant was born in August of 1849 and died in September of 1849. Catherine Elizabeth Parks – Catherine was born October 15, 1861 in Missouri. She married Thomas Stokes and they had at least 10 children. His Find A Grave memorial includes a newspaper clipping telling of Catherine and Thomas being robbed. She died October 29, 1913 and is buried in Cedarcreek, Taney County, Missouri. She was 52. Her Find A Grave memorial is here. Mary Ann Parks – Mary Ann was born February 8, 1865 in Arkansas. She married George Washington Taylor in about 1882. They had 7 children. She died October 3, 1951 in Slaton, Lubbock County, Texas. She was 86. Her Find A Grave memorial is here. George Brittain and Memory Larimore are my 4x great grandparents, parents of my 3x great grandmother Jane Brittain. George Brittain was born in 1813 in Barren County, Kentucky. His parents are Parks Brittain and Sarah Price. In 1820 the family was in Rockcastle, Kentucky. In 1830 the family was in Henricks, Indiana. George Brittain and Memory Larimore were married on February 11, 1838 in Knox County, Illinois. On the same day in the same county, George’s brother Frances married Memory’s sister Effemony. Earlier that month in the same county, George’s sister Jane Eliza married Memory’s brother John. On the 1850 US Census, George and Memory were both 37. They lived in Keokuk County, Iowa with 4 of their children: Jane was 11; Eli was 9; Mary was 2; Sarah was a newborn. Also living in the house was Memory’s mother, Mary Larimore, age 68. George and Memory had 2 more sons, Harvey, age 7; and James, age 6; but I can’t find them on a census. On the 1860 US Census, George and Memory were listed as being 45 years old. They lived in Medicine, Mercer County, Missouri and had 6 children at home: Harvey was 17; James was 15; Mary was 12; Sarah was 10; Frances was 6; Melcina was 2. Their oldest children Eli and Jane were both married. On the 1870 US Census, George and Memory were listed as being 58 years old. They lived in Clifton, Wilson County, Kansas and had 2 children at home: Frances, age 16; and Melcina, age 12. On the 1875 Kansas Census, George and Memory were listed as age 59 and they lived in Painterhood, Howard County, Kansas. It is noted that Memory can’t read or write. Their son Frances and daughter Sarah lived nearby. George is said to have died in 1877 or 1878 in Taney County, Missouri. This may be his Find A Grave memorial. On the 1880 US Census, Memory was age 66 and a widow. She lived in Mound Valley, Labette County, Kansas, with daughter Sarah Catherine Brittain Gilstrap’s family. Memory is said to have died on October 30, 1885 in Taney County, Missouri. She was 71 or 72. Jane Brittain – My 3x great grandmother Jane was born January 2, 1839 in Henderson, Knox County, Illinois. She married James Henry Bly on May 31, 1854 in Caldwell County, Missouri. They had 4 children. She married Calvin Parton in May 1865. They had 4 children. Jane died October 30, 1911 in Omaha, Arkansas. She was 72. Read about her here. Eli Brittain – Eli was born in 1841 in Henderson, Knox County, Illinois. He married Margaret Balsher, and they had a son named James Eli Brittain in 1862. Eli died on May 9, 1863 in Helena, Phillip County, Arkansas while serving Iowa in the Civil War. He was 22. Cause of death was Typhoid Fever. His brothers Harvey and James served with him. His Find A Grave memorial is here. Harvey Brittain – Harvey was born February 14, 1843 in Knox County, Illinois. He married Sarah Ellen Stanturf on October 28, 1860. They had 10 children. He served with his brothers Eli and James in the Civil War, Company F of 33rd Iowa Regiment. He died on July 6, 1904 in Idaho. He was 61. His Find A Grave memorial is here. James Franklin Brittain – James was born September 13, 1844 in Knox County, Illinois. He married Ursula Olive Kirkendall on April 4, 1861 in Grundy County, Missouri. They had 3 children and divorced. He served in the Civil War with brothers Eli and Harvey. He later married Mary Jane Gaines on November 11, 1869 in Wilson County, Kansas. They had 12 children. He died on December 7, 1925 in Tulsa County, Oklahoma. He was 81. His Find A Grave memorial is here. Mary Ethelda Brittain – Mary was born May 1, 1848. She married James Milton Hopper and they had 10 children. She died November 29, 1919 in Midvale, Washington County, Idaho. She was 71. Her Find A Grave memorial is here. Sarah Catherine Brittain – Sarah was born February 10, 1850 in Iowa. She married William Henry Gilstrap on October 18, 1868 in Wilson County, Kansas. They had at least 8 children. She died May 20, 1899. She was 49. Her Find A Grave memorial is here. After her death, William married her sister Melcina. Frances McGuire Brittain – Frances was born in about 1854 in Iowa. He married Sarah Elizabeth Hopper in about 1872. They had at least 3 children. The last record I find for him is the 1880 US Census where he lived with Sarah and the 3 children in Mound Valley, Labette County, Kansas. Sarah died in 1889 at age 36 in Taney County, Missouri. Melcina Brittain – Melcina was born in 1858. She married William Davis in 1876. They had 6 children, and he died in 1898. She married her sister Sarah’s widow, William Henry Gilstrap, in 1900. My last record of her is the 1920 US Census, where she lived with husband William, two Davis sons and a grandson in Cherokee County, Oklahoma. William Gilstrap died in 1924. John Bly and Charity Adams are my 4x great grandparents, parents of my 3X great grandfather James Henry Bly. John Bly was born in December 29, 1780 in Amherst, Virginia. David Bly, presumed to be his father, gave permission for him to marry. See comment section for thoughts from cousins on John’s parents. If you have any thoughts to add, please comment! Charity Adams was born in about 1783 in Kentucky. She was an orphan by 1800 when she married. It’s noted by some that her father was named William. See comment section for thoughts from cousins on Charity Adams. If you have any thoughts to add, please comment! John Bly and Charity Adams were married on September 25, 1800 in Lincoln County, Kentucky. John was 19 and Charity was 17. It is said that John had permission of David Bly to marry and that Charity claimed to be an orphan, and no one signed for her. I haven’t seen this record, so if you have it I would love to see it. On the 1810 US Census, John Bly was head of a household in Rockcastle, Kentucky. The household had 5 members: 2 males under age 10 (David was 10 and Martin was 4); 1 male 26-44 (John was 30); 1 female under age 10 (Henrietta was 1); 1 female aged 26-44 (Charity was 27). Listed next on the census is David Bly, so that may have been John’s father. That household had 3 members: 1 male over age 45; 1 female aged 10-15; 1 female over age 45. On the 1830 US Census, John Bly was head of a household in Putnam, Indiana. There were 11 in the household: 1 male under age 5 (James was 5); 1 male ages 10-14 (Bryant was 16); 3 males aged 15-19 (Abraham was 20, John was 18, and Joshua was 17); 1 male ages 40-49 (John was 50); 2 females age 5-9 (Susan was 3 and Elizabeth was 8); 1 female aged 10-14 (Millicent was 10); 1 female aged 20-29 (Henrietta was 21); 1 female ages 40-49 (Charity was 47). Listed next on the census is the household of Martin Bly, their son. US General Land Office Records show a January 5, 1831 Land Grant for 80 acres in Putnam County, Indiana for a John Bly. I don’t know if it is for this John Bly, his son John Bly, or an unrelated John Bly. John Bly died August 7, 1840. He was 59. His Find A Grave memorial is here. On the 1840 US Census, Charity is head of household in Clark, Montgomery County, Indiana. It’s a household of 4 people: 1 male aged 15-19; 1 male aged 20-29; 1 female aged 15-19; 1 female aged 50-59. Listed next on the Census are the households of William Bly and Abraham Bly. On the 1850 US Census, Charity, age 65, was living with son Abraham, age 39, his wife Mary, age 36, and their 9 children, and Mary’s father. They were farming in Clark, Montgomery County, Indiana. On the 1860 US Census, Charity was 77. She lived with her son James Bly, age 35 (my 3x great grandfather), his wife Jane age 21, and their 3 children. The family was farming in Medicine, Mercer County, Missouri. Charity died after she was found on the 1860 US Census, in Medicine, Mercer County, Missouri. Her Find A Grave memorial is here. Note: I have found very little to connect children to John Bly and Charity Adams. Here’s what I have on potential children. John Martin Blye – Martin was born October 6, 1806. He married Elizabeth Carman on March 10, 1835 in Montgomery, Indiana. On the 1850 US Census they were in Franklin, Montgomery, Indiana with 7 children. He died March 1, 1894. He was 87. His Find A Grave memorial is here. Henrietta Bly – Henrietta was born about 1809. She married James Harris on December 4, 1831 in Montgomery County, Indiana. Abraham Bly – Abraham was born October 31, 1810 in Lincoln County, Kentucky. He married Mary Ann Carman on January 22, 1835 in Montgomery County, Indiana. They had at least 8 children. Later he married Elizabeth Hancock on April 29, 1868 in Warren County, Iowa. He died February 17, 1886 in Iowa. He was 75. His Find A Grave memorial is here. Joshua Bly – Joshua was born in 1813 in Kentucky. He married Mary Baker on September 21, 1837 in Hendricks, Indiana. On the 1850 US Census they lived in Center, Hendricks County, Indiana with their 6 children. Bryant Bly – Bryant was born on June 24, 1814. He married Charity Moore on January 25, 1842 in Montgomery County, Indiana. They had at least 11 children. He died on March 25, 1882. He was 67. His Find A Grave memorial is here. Millicent Emilia Bly – Millicent was born November 1, 1820 in Barren County, Kentucky. She married Joel Adams on May 14, 1840 in Montgomery County, Indiana. They had no children. She married William Brittain in 1848 in Montgomery County, Indiana. He had 6 children and they had 4 children together. She died February 6, 1872. She was 51, Her Find A Grave memorial is here. Elizabeth Bly – Elizabeth was born on November 12, 1822 in Montgomery County, Indiana. She married Gabriel F. Keath on November 13, 1838 in Montgomery County, Indiana. She died on June 19, 1840 in New Maysville, Putnam County, Indiana. She was 17 years old and had given birth to a daughter. Her Find A Grave memorial is here. James Henry Bly – My 3x great grandfather James was born in 1825 in Kentucky. He married Jane Brittain on May 31, 1854 in Caldwell County, Missouri. They had 4 children. He died January 11, 1864 at home in Steady Run, Iowa, after becoming ill while serving in the Civil War. He was 38 or 39. His Find A Grave memorial is here.Read more about him here. Susan Bly – Susan was born in 1827. She married Leroy Brock on April 2, 1848 in Montgomery County, Indiana. They had 8 children. She died prior to 1880, when her husband was found a widower living in Niantic, Macon, Illinois.